Soy Protein Nuggets (Isolated Soy Protein, Tapioca Starch, Salt), Corn Syrup, Chocolate Flavored Coating (Sugar, Fractionated Palm Kernel Oil, Cocoa Powder [Processed With Alkali], Soy Lecithin, Nonfat Milk Powder, Vanilla), Almonds, Sodium Caseinate, Raisins, Glycerine, Less Than 2% Of The Following: High Oleic Safflower Oil, Corn Syrup Solids, Natural Flavor, Salt, Guar Gum, Soy Lecithin(Calcium Phosphate, Ascorbic Acid (Vit. C), Magnesium Oxide, D-Alpha Tocopheryl Acetate (Vit. E), Niacinamide (Vit. B3), Zinc Oxide, Calcium Pantothenate (Vit. B5), Ferrous Fumarate (Iron), Pyridoxine Hydrochloride (Vit. B6), Vitamin A Palmitate, Riboflavin (Vit. B2), Thiamin Mononitrate (Vit. B1), Folic Acid (Vit. B9), Chromium Chloride, Biotin (Vit. B7), Sodium Selenite, Sodium Molybdate, Cyanocobalamin (Vit. B12)). Contains Soy, Almond and Milk Ingredients; Manufactured In A Facility That Processes Egg, Peanut, Other Tree Nuts and Wheat Ingredients. Brown Rice Syrup, Corn Syrup, Chocolate Drops (Sugar, Chocolate Liquor, Cocoa Butter, Soy Lecithin, Vanilla), Sodium Caseinate, Soy Protein Isolate, Sweet Cream Layer (Corn Syrup, Fructose, Palm Kernel Oil, Milk Protein Isolate, Natural Flavor, Salt, Soy Lecithin), Whey Protein Isolate, Brown Sugar, Pasteurized Whole Egg Powder, Fructose Syrup, Chocolate Flavored Coating (Sugar, Fractionated Palm Kernel Oil, Cocoa Powder [Processed With Alkali], Soy Lecithin, Nonfat Milk Powder, Vanilla), Glycerine; Less than 2% of the following, High Oleic Safflower Oil, and High Oleic Sunflower Oil, Butter Powder (Butter, [Cream, Salt], Nonfat Milk, Tocopherols, Ascorbyl Palmitate), Calcium Phosphate, Peanut Butter, Natural Flavor, Chocolate Powder (Natural Cocoa Powder, Sugar, Chocolate Liquor, Cocoa Butter, Soy Lecithin, Vanilla), Salt. (Calcium Phosphate, Ascorbic Acid (Vit. C), Magnesium Oxide, D-Alpha Tocopheryl Acetate (Vit. E), Niacinamide (Vit. B3), zinc Oxide, Calcium Pantothenate (Vit. B5), Ferrous Fumarate (Iron), Pyridoxine Hydrochloride (Vit. B6), Vitamin A Palmitate, Riboflavin (B2), Thiamin Mononitrate (Vit B1), Folic Acid (Vit. B9), Chromium Chloride, Biotin (Vit. B7), Sodium Selenite, Sodium Molybdate, Cyanocobalamin (Vit. B12)). Contains Milk, Eggs, Peanut and Soy Ingredients; Manufactured In A Facility That Processes Tree Nuts and Wheat. Contains Milk, Soy And Wheat Ingredients; Manufactured In A Facility That Processes Eggs, Peanuts And Tree Nuts. Contains Soy Nuts, Peanuts And Milk; Manufactured In A Facility That Processes Eggs, Tree Nuts And Wheat. Contains Almonds, Milk And Soy Ingredients; Manufactured In A Facility That Processes Peanuts, Eggs And Wheat. Soy Protein Nuggets (Isolated Soy Protein, Cocoa [Rocessed With Alkali], Tapioca Starch, Salt), Chocolate Flavored Coating (Sugar, Fractionated Palm Kernel Oil, Cocoa [Processed With Alkali], Soy Lecithin, Vanilla), Corn Syrup, Roasted Almonds (Almonds, Safflower Oil, Soy Protein Isolate, Fructose, Chocolate Powder (Cocoa Powder, Sugar, Chocolate Liquor, Cocoa Butter, Vanilla), Chocolate Cookie Pieces (Bleached Wheat Flour, Sugar, Cocoa [Processed With Alkali], Sunflower Oil, Salt, Baking Soda), Chocolate Liquor, Cocoa Fructose (Fructose, Water, Corn Maltodextrin, Cocoa [Processed With Alkali], Natural Cocoa, Salt, Carrageenan, Natural Flavors, Tocopherol, Ascorbic Acid), Cocoa [Processed With Alkali], , High Oleic Safflower And/or Sunflower Oil.Glycerin, Natural Flavors, Caramel Color And Salt.Calcium Phosphate, Ascorbic Acid, D-Alpha Tocopherol Acetate, Magnesium Oxide, Niacinamide, Zinc Oxide, Calcium Pantothenate, Ferrous Fumarate, Pyridoxine Hydrochloride, Vitamin A Palmitate, Riboflavin, Thiamine Mononitrate, Folic Acid, Chromium Chloride, Biotin, Sodium Selenite, Sodium Molybdate, And Cyanocobalamin. Contains Soy, Almond, Wheat And Milk Ingredients. Manufactured In A Facility That Processes Peanuts, Other Tree Nuts And Eggs. Soy Protein Nuggets (Isolated Soy Protein, Cocoa Powder [Processed With Alkali], Tapioca Starch, Salt), Chocolate Layer (Corn Syrup, Palm Kernel Oil, Invert Sugar, Sugar, Chocolate Liquor, Cocoa Powder [Processed With Alkali], Milk Protein Isolate, Natural Flavors, Soy Lecithin, Vanilla Extract, Gum Arabic, Xanthan Gum, Carob Seed Gum), Chocolate Flavored Coating (Sugar, Fractionated Palm Kernel Oil, Cocoa Powder [Processed With Alkali], Soy Lecithin, Nonfat Milk Powder, Vanilla), Corn Syrup, Soy Protein Isolate, Chocolate Drops (Sugar, Chocolate Liquor, Cocoa Butter, Soy Lecithin, Vanilla), Fructose Syrup, Chocolate Liquor, Cocoa Powder [Processed With Alkali], Less Than 2% Of The Following: High Oleic Safflower Oil, And/Or High Oleic Sunflower Oil, Chocolate Powder (Natural Cocoa Powder, Sugar, Chocolate Liquor, Cocoa Butter, Soy Lecithin, Vanilla), Cocoa Fructose (Fructose, Corn Maltodextrin, Cocoa Powder [Processed With Alkali], Natural Cocoa, Salt, Carrageenan, Natural Flavors, Tocopherol, Ascorbic Acid), Glycerine, Natural Flavors, Caramel Color, Salt(Calcium Phosphate, Ascorbic Acid (Vit. C), Magnesium Oxide, D-Alpha Tocopheryl Acetate (Vit. E), Niacinamide (Vit. B3), Zinc Oxide, Calcium Pantothenate (Vit. B5), Ferrous Fumarate (Iron), Pyridoxine Hydrochloride (Vit. B6), Vitamin A Palmitate, Riboflavin (Vit. B2), Thiamin Mononitrate (Vit. B1), Folic Acid (Vit. B9), Chromium Chloride, Biotin (Vit. B7), Sodium Selenite, Sodium Molybdate, Cyanocobalamin (Vit. B12)). Contains Milk And Soy Ingredients; Manufactured In A Facility That Processes Eggs, Peanuts, Tree Nuts, And Wheat. Contains Soy Milk And Peanut Ingredients; Manufactured In A Facility That Processes Eggs, Tree Nuts, And Wheat. Caramel Layer (Corn Syrup, Sugar, Sweetened Condensed Milk, Palm Kernel Oil, Salted Butter, Fructose, Milk Protein (Total Milk Protein With Whey Protein Concentrate), Dextrose, Vanilla Extract, Soybean Lecithin, Salt), Soy Protein Nuggets (Isolated Soy Protein, Cocoa (Processed With Alkali), Tapioca Starch), Soy Protein Isolate, Dark Chocolate Layer (Corn Syrup, Sugar, Palm Kernel Oil, Natural Chocolate Liquor, Cocoa Powder (Processed With Alkali), Milk Protein Isolate, Soy Lecithin, Natural Flavor, Salt, Xanthan Gum, Locust Bean Gum, Gum Arabic), Chocolate Flavored Coating (Sugar, Fractionated Palm Kernel Oil, Cocoa Powder (Processed With Alkali), Soy Lecithin, Nonfat Milk Powder, Vanilla), Brown Rice Syrup, Chocolate Drops (Sugar, Chocolate Liquor, Cocoa Butter, Soy Lecithin, Vanilla), Fructose Syrup, Butter (Cream, Salt), Chocolate Cookie Pieces (Wheat Flour, Organic Dried Cane Syrup, Canola Oil, Cocoa (Processed With Alkali), Salt, Sodium Bicarbonate), High Oleic Safflower Oil, Glazed Pecans (Sugar, Pecans, Natural Flavor, Butter, Salt, Soy Lecithin), Fructose, Cocoa Butter, Whey Protein Isolate, Glycerine; Less than 2% of the following, Natural Flavor, Natural Cocoa Powder, Sugar, Chocolate Liquor, Cocoa Butter, Soy Lecithin, Vanilla), Salt. (Calcium Phosphate, Ascorbic Acid (Vit. C), Magnesium Oxide, D-Alpha Tocopheryl Acetate (Vit. E), Niacinamide (Vit. B3), zinc Oxide, Calcium Pantothenate (Vit. B5), Ferrous Fumarate (Iron), Pyridoxine Hydrochloride (Vit. B6), Vitamin A Palmitate, Riboflavin (B2), Thiamin Mononitrate (Vit B1), Folic Acid (Vit. B9), Chromium Chloride, Biotin (Vit. B7), Sodium Selenite, Sodium Molybdate, Cyanocobalamin (Vit. B12)). Contains Soy, Milk And Wheat Ingredients; Manufactured In A Facility That Processes Eggs, Peanuts, And Tree Nuts. Less than 2% of the Following: Fructose Syrup, Natural Flavors, Sugar. Brown Rice Syrup, Sodium Caseinate, Soy Protein Isolate, Cinnamon Flavored Chips (Sugar, Palm Kernel Oil, and Palm Oil, Whey Powder, Ground Cinnamon, Nonfat Dry Milk Solids, Anhydrous Dextrose, Soy Lecithin, Salt, Nautral Flavor), Butter (Cream, Salt), Sweet Cream Layer (Tapioca Syrup, Pasteurized Whole Egg Powder [Cultured with Nonfat Milk], Soy Lecithin, Modified Corn Starch, Lactic Acid, Vanilla Extract), Almond Butter, Whey Protein Isolate, Brown Sugar, Glycerine, Safflower Oil, Cocoa Butter; Less than 2% of the Following: Natural Flavor, Cinnamon, Salt, Vitamin & Mineral Blend (Calcium Phosphate, Ascorbic Acid [Vit. C], Magnesium Oxide, dl-Alpha-Tocopheryl Acetate [Vit. E], Niacinamide [Vit. B3], Zinc Oxide, Calcium Pantothenate [Vit. B5], Ferrous Fumarate [Iron], Pyridoxine Hydrochloride [Vit. B6], Vitamin A Palmitate, Riboflavin [Vit. B2], Thiamine Mononitrate [Vit. B1], Folic Acid [Vit. B9], Chromium Chloride, Biotin [Vit. B7], Sodium Selenite, Sodium Molybdate, Cyanocobalamin [Vit. B12]). Brown rice syrup, sodium caseinate, Tapioca syrup, Soy Protein Isolate, salted butter (cream, salt), white chocolate chunks (sugar, cocoa butter, whole milk powder, nonfat dry milk, milkfat, soy lecithin, natural vanilla extract), chocolate cookie pieces (unbleached unenriched wheat flour, sugar, palm and palm kernel oil, cocoa [processed with alkali], salt, sodium bicarbonate, soy lecithin), sweet cream layer (tapioca syrup, fructose, palm kernel oil, milk protein isolate, natural flavor, salt, soy lecithin, vanilla extract), fructose syrup, chocolate flavored coating (sugar, fractionated palm kernel oil, cocoa powder [processed with alkali], soy lecithin, nonfat milk powder, vanilla), brown sugar, pasteurized whole egg powder, safflower oil, whey protein isolate, glycerine; less than 2% of the following: natural flavor, peanut butter, salt, chocolate powder (natural cocoa powder, sugar, chocolate liquor, cocoa butter, soy lecithin, vanilla), vitamin and mineral blend (calcium phosphate, ascorbic acid [vit c], magnesium oxide, dl-alpha-tocopheryl acetate [vit e], niacinamide [vit b3], zinc oxide, calcium pantothenate [vit b5], ferrous fumarate [iron], pyridoxine hydrochloride [vit b6], vitamin a palmitate, riboflavin [vit b2], thiamine mononitrate [vit b1], folic acid [vit b9], chromium chloride, biotin [vit b7], sodium selenite, sodium molybdate, vitamin b12. For maximum shelf life store ZonePerfect® Nutrition Bars below 75° F.
Contains Soy, Milk, egg, wheat, and peanut Ingredients. Manufactured in a facility that processes peanuts, other tree nuts. Soy Protein Nuggets (Isolated Soy Protein, Cocoa [Rocessed With Alkali], Tapioca Starch, Salt), Chocolate Layer (Corn Syarup, Sugar, Palm Kernel Oil, Unsweetened Chocolate, Invert Sugar, Cocoa [Rocessed With Alkali], Milk Protein, Soy Lecithin, Salt, Xanthan Gum, Carob Seed Gum, Gum Arabic, Vanilla Extract With Other Natural Flavors), Chocolate Flavored Coating (Sugar, Fractionated Palm Kernel Oil, Cocoa [Rocessed With Alkali], Soy Lecithin, Vanilla), Corn Syrup, Soy Protein Isolate, Chocolate Drops (Sugar, Chocolate Liquor, Cocoa ButterHigh Oleic Safflower And/or High Oleic Sunflower Oil, Chocolate Powder (Cocoa Powder, Sugar, Chocolate Liqour, Cocoa Butter, Vanilla), Cocoa Fructose (Fructose, Water, Corn Maltodextrin, Cocoa [Rocessed With Alkali], Natural Cocoa, Salt, Carrageenan, Natural Flavors, Tocopherol, Ascorbic Acid), Glycerin, Natural Flavors, Caramel Color And Salt.Calcium Phosphate, Ascorbic Acid, D-Alpha Tocopherol Acetate, Magnesium Oxide, Niacinamide, Zinc Oxide, Calcium Pantothenate, Ferrous Fumarate, Pyridoxine Hydrochloride, Vitamin A Palmitate, Riboflavin, Thiamine Mononitrate, Folic Acid, Chromium Chloride, Biotin, Sodium Selenite, Sodium Molybdate, And Cyanocobalamin. Vitamin and Mineral Blend [calcium phosphate, ascorbic acid (vitamin C), magnesium oxide, d-alpha-tocopheryl acetate (vitamin E), niacinamide (vitamin B3), zinc oxide, calcium pantothenate (vitamin B5), ferrous fumarate (iron), pyridoxine hydrochloride (vitamin B6), vitamin A palmitate, riboflavin (vitamin B2), thiamine mononitrate (vitamin B1), folic acid (vitamin B9), chromium chloride, biotin (vitamin B7), sodium selenite, sodium molybdate, vitamin B12. For maximum shelf life, store ZonePerfect Nutrition Bars below 75° F.
Contains soy and milk ingredients; Manufactured in a facility that processes eggs, peanuts, tree nuts, and wheat. Soy protein nuggets (isolated soy protein, tapioca starch, salt), corn syrup, Greek yogurt flavored coating (sugar, fractionated palm kernel oil, non-fat milk, Greek yogurt powder [cultured with nonfat milk, milk protein concentrate], soy lecithin, natural flavors, lactic acid, citric acid), gum acacia, soy protein isolate, strawberry flavored cranberries (cranberries, sugar, natural strawberry flavor with other natural flavors, citric acid, sunflower oil, elderberry juice concentrate), strawberry paste (fruit [strawberry puree, concentrated apple puree, concentrated apple juice], sugar, glucose syrup, glycerol, palm fat, maize starch, red beet juice powder, natural flavor, wheat fiber, malic acid, calcium lactate, sunflower lecithin), pomegranate pieces (fruit [pomegranate juice, concentrated apple puree, concentrated elderberry juice], invert sugar, glycerol, sugar, wheat fiber, pectin, citric acid, natural flavor), blueberry flavored cranberries (cranberries, sugar, grape juice concentrate, blueberry juice concentrate, sunflower oil), fructose syrup, oligofructose; less than 2% of the following: high oleic safflower oil, natural flavor, calcium phosphate, citric acid. Soy protein nuggets (isolated soy protein, cocoa [processed with alkali], tapioca starch, salt), chocolate chunks (sugar, unsweetened chocolate, cocoa butter, soy lecithin, vanilla), brown rice syrup, sweet cream layer (corn syrup, crystalline fructose, palm kernel oil, milk protein isolate, natural flavor, salt, soy lecithin), gluten free rolled oats, butter (cream, salt), soy protein isolate, cocoa butter, pasturized whole egg powder, brown sugar; Less than 2% of the following: natural flavor, soy lecithin and cocoa (processed with alkali). Contains soy, milk and egg ingredients; manufactured in a facility that also processes peanuts, tree nuts and wheat. For maximum shelf life, store ZonePerfect Nutrition Bars below 75 F.
ZonePerfect Classic Nutrition Bars are the easiest, most convenient way to enter the Zone. Balanced with the correct combination of protein, carbohydrate and fat, the bars support the burning of stored body fat. * In addition, ZonePerfect Nutrition Bars are fortified with 19 critical vitamins and minerals as well as the unique Omega-3 essential fatty acid EPA, which is found in coldwater fish. You can use ZonePerfect Nutrition Bars in a couple of ways. 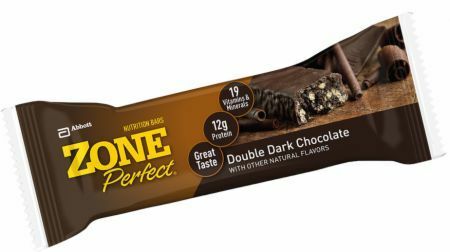 First, the ZonePerfect Nutrition Bar can be used as a very handy meal replacement or Zone snack (a snack is one-half of a bar ) for those times when you can't make or find an appropriate Zone meal or snack, such as when you are traveling, during meetings or just during extended periods between meals.